Nepeta ‘Walker’s Low’ is the Perennial Plant Association’s 2007 Perennial Plant of the Year. The name of this blue-flowering perennial can be a bit deceiving: it’s named for an Irish garden, rather than a low-growing habit. It actually grows about 3 feet tall. 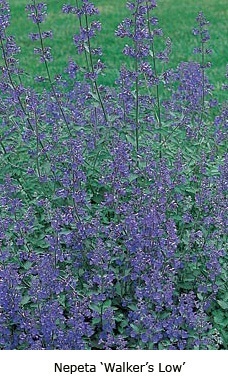 Introduced in 1988, Walker’s Low catmint is a long bloomer with blue-violet flowers and attractive grey-green foliage. This easy-to-grow perennial is drought tolerant once established, and is resistant to most pests and disease problems. Size: Grows 30 to 36 inches (76-90 cm) tall and wide. Bloom time: Long blooming, begins in May in southern regions and June to July in the north, and continues to flower for much of the season. Where to grow: Best in full sun, but can tolerate shade in hot climates. Prefers well drained soil and neutral pH. How to use in flower garden: Makes a good edging plant for perennial borders or herb garden. If you can’t grow lavender as an edger in the flower or herb garden, Walker’s Low catmint with its lavender blue flowers makes an attractive substitute. Other garden qualities: Its soft, grey-green leaves release an attractive aroma when crushed. Attracts bees, butterflies and other pollinating insects, but is rabbit and deer resistant. Companions for Nepeta ‘Walker’s Low’: Combines well with lamb’s ears, sage, thyme, lavender and blue ornamental grasses such as blue oat grass and blue fescue. Other excellent perennial companions include daylilies, coreopsis, peonies, dianthus, foxgloves and bearded iris. A classic English garden pairing is Nepeta ‘Walker’s Low’ with roses. Some experts believe ‘Walker’s Low’ Nepeta to be a hybrid between two species, nepetella and racemosa, and it is often labeled as this hybrid species (x faassenii). Other authorities place it under one parent (racemosa). Whatever true origin of this cultivar, its parent species are native to the Caucasus and northern Iran, which accounts for this cultivar’s ability to weather heat and drought.